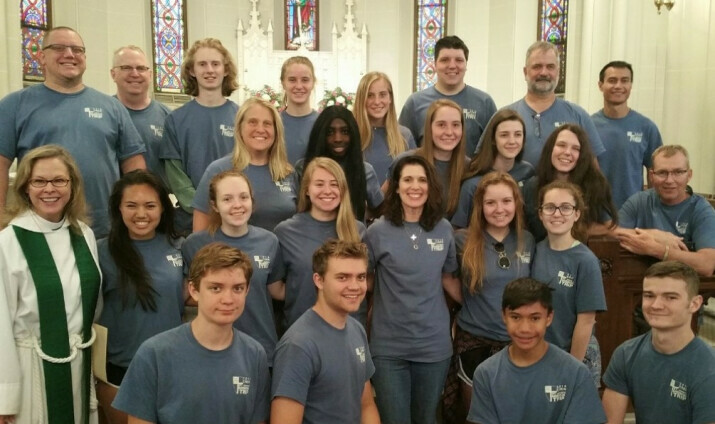 Each summer shortly after school ends, St. John's sponsors a Youth Mission Trip that is open to all St. John's youth who are high school through college age. Last summer we sent 17 youth and 7 adult chaperones to Appalachia in Eastern Kentucky. There, they worked on projects to make homes warmer, safer and drier. Construction activities included installing new floors, building new steps and porches, installing new siding, as well as other home maintenance and repair activities. Combined with five full days of construction activities, there was fun and fellowship each evening, all of which occurred in a Christian based setting. The youth mission trips began as annual events in 2009, when we sent 9 youth and 3 adults to Cass Lake, Minnesota to work with the Ojibwe Native Americans. In 2010, we sent another group to Bay St. Louis, Mississippi to assist with Hurricane Katrina reconstruction. Since 2011, we have been sending increasing numbers of youth and adult chaperones to eastern Kentucky to assist those less fortunate in Appalachia. There we work with Appalachia Service Project, an organization which has been coordinating mission projects in Appalachia for over 30 years. Throughout the year, there are fundraising activities that the youth participate in to help cover the costs of the mission trips. These fundraisers cover about half of the costs and the other half is paid for by the participants. Interested youth and adults should contact the church office for more information.